In her last blog for Scottish Wedding Directory (sob! 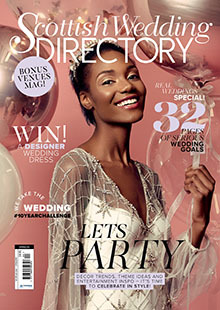 ), Laura Devine dissects the Wedding of the Year, Meghan + Harry’s 19th May nuptials, and pulls out the trends you’ll be seeing in 2018/19! It’s only been a few weeks, but, undoubtedly, the royal wedding will influence trends for years to come. Brides and suppliers alike are already trying to emulate Meghan’s style, match the pantone of her nails, and recreate some of the flavours from her wedding breakfast. Instead of a traditional, high tiered wedding cake, Meghan opted for a simple and short two-tier cake, with two more tiers placed separately at stepped heights. The way the four tiers of three separate cakes were displayed mimicked that of a traditional tall tiered wedding cake, but I rather liked the way it was ˜deconstructed’ “ much more modern, much easier to cut, and much easier to serve! I also love the idea that, unlike Harry and Meghan, this would also allow you to go a bit more mix and match with your cake tiers. You could have a few flavours, styles, textures, or colour combinations, even made by different family members, but some simple styling with some fresh flowers could bring it all together. Vogue UK reported that Harry hand picked many of the flowers in Meghan’s bouquet from their private gardens at Kensington Palace; said to include Forget-Me-Nots as a touching tribute to his mum, Princess Diana (Forget-Me-Nots were her favourite flowers). Such a lovely sentiment and so much more personal than the florist using their own stock! I love this idea and I am increasingly seeing more of my London brides going for more wild and rustic bouquets that are home grown by family members. For those that are less ambitious, try out some simple centrepieces using single stem vases or bottles first. Meghan chose to walk most of the way down the aisle at St George’s Chapel by herself “ and why not? On one hand I completely disagree with the sentiment of a father ˜giving away’ the bride, thus indicating the father is passing over ownership to the husband, but on the other hand it is a nice tradition and a lovely moment to share with your dad. However, in today’s modern world, with equally modern and diverse families, the social and family politics of weddings only adds stress to the day. Since the royal wedding, I have already had two separate requests from brides to be who wish to ˜make an entrance’ by themselves on the day, and would like some help coordinating this¦ and why shouldn’t you take full advantage of the spotlight on one of the most wonderful and important days of your life? Keep an eye out on my Instagram (@devinebride) to see how those ones play out! Will you be taking any inspo from Harry Meghan’s wedding? I’d love to hear what you’ve got planned!